Who Needs a Hand Therapist? Those who have sustained an injury to the elbow, wrist or finger(s) through either sudden injury (amputation, fracture), a gradual onset of symptoms (carpal tunnel syndrome), or a chronic condition (arthritis). HTC is a credential issued by the California Board of Occupational Therapy signifying an Occupational Therapist has education and training in hand therapy to "practice safely". The therapist must have performed 480 hours of supervised hand therapy and have completed 45 hours of hand therapy continuing education. No minimum amount of experience or exam is required. CHT is a credential issued by the Hand Therapy Certification Commission, a nationally recognized organization. A CHT "Certified Hand Therapist" is either a Physical or Occupational Therapist who has practiced a minimum of 5 years, completed a minimum of 2000 hours of hand therapy, and has successfully passed a rigorous exam. The CHT credential provides the public confirmation that the clinician is considered an expert in hand therapy. Made to Move Physical Therapy, Inc. has a certified hand therapist on staff! 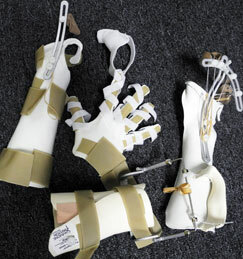 We offer state of the art splinting material for upper hand/wrist/elbow injuries and/or post-surgical immobilization. Your therapist can help you regain function in your elbow, wrist, or hand as quickly as possible through a combination of manual techniques such as exercise, massage and mobilization, and training to help you use your hand for maximal function. Therapists emphasize the need to get the affected area moving as quickly as is safe after an injury. The longer a joint remains immobile, the greater the possibility that excess swelling may lead to decreased use of the area. It is especially important to minimize edema (swelling) in the hand. The hand is so compact, and so intricately constructed with its many small bones and joints that the natural swelling that accompanies an injury can be a serious problem in itself. The back of the hand is the most common place for swelling to occur, and if the fluid that accompanies the edema is not displaced, the tissue inside the hand can become almost like glue in texture. When scarring sets in, the capsules around the joints shrink and the ligaments tighten, causing loss of function in the hand. Moving the hand as soon as is safely possible displaces the fluid that causes swelling. It also lessens the chance that the hand's range of motion will be permanently diminished.